Aerojet developed the Nike-Iroquois (also called Niro) to fulfill a U.S. Air Force requirement for a low-cost sounding rocket with roll control and high structural strength. The vehicle consisted of an M5 Nike booster stage and a Thiokol TE-M-388 Iroquois upper stage. 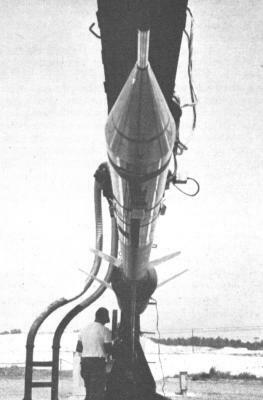 Unlike Nike boosters in many other sounding rocket applications, the Nike-Iroquois boosters retained the original three-fin configuration. The Niro was first launched by the USAF on 27 November 1964. The Nike-Iroquois could lift a small payload of 18 kg (40 lb) to about 290 km (180 miles) and a large one of 82 kg (180 lb) to about 110 km (70 miles) altitude. The Air Force Cambridge Research Lab launched a total of 213 rockets of this type until the last mission on 26 February 1979. The experiments covered aeronomy, plasma physics, ionosphere physics and other topics. One reason for the USAF's Nike-Iroquois launches was that the service wanted to keep active its capability for high-altitude soundings of nuclear tests, should the atmospheric test ban be lifted.